No, you did not read that headline wrong. Ladies and gentlemen, Google+ will be shutting down permanently in April 2019. Google+ is Google’s very own social media network, one that many business owners have been able to share content on, as well as connect with several worldwide communities within the same industry. It was originally developed in 2011 and since then it proved to be a handy network…provided you used it regularly. It was also an excellent means to build up some organic SEO whenever you shared a blog post. That’s because Google knows when a link comes from a trustworthy resource. In the past decade they’ve cracked down on many a poorly developed website from getting any front page coverage, with penalisations towards any site developer who would so dare clog up the Internet’s white space with meaningless content and spammy links. If you wanted to post and share meaningful content, then Google+ was a good way to do it. It was, for a while, a social network with a few decent benefits. The answer is long-winded, but bear with us. Back in October 2018, a report came in the Wall Street Journal that a bug had been discovered within the People APIs in Google+, which resulted in massive data exposure. This sent people within its communities into a panic, because there was a lot of private information (in this case names, genders, emails, and occupations to name a few) connected to the APIs. While there was no evidence found that the data had been improperly accessed, and the bug was fixed, people made a big stink enough to the point where Google announced it would shut the network down on August 31, 2019, very shortly after the report came out. Now you may be wondering “I thought you said the date was April?” Yes, that’s still correct, and that’s because a similar event happened again! The second occurrence took place in November 2018, and once again it was found within the network’s APIs; a security flaw exposed 52.5 million Google+ users’ personal data. And, once again, Google decided it was best to permanently sunset Google+ and in fact, they hastened the deadline from August to April. In addition to this mess, Google’s vice president of project management David Thacker admitted that Google+ had been a failure due to its “low usage and engagement”, with 90% of all user sessions lasting 5 seconds or even less. You can read more about why Google+ is shutting down from Google’s blog if you crave more information. How can you take steps to make sure your website is as secure as possible? First and foremost, make sure that your website is not only up to date, but that you are using software that is secure and is being properly looked after by its developer! So many people have websites that they don’t bother to update the software on and don’t realize that they are creating a danger for their business, their business’s reputation, and their customers. We get that you may not be technical, or have the time or desire to look after these things and that’s why we created the WP Care+ Maintenance Plans – to keep your site up to date and secure. If you feel adamant about checking up on your site’s security and private information however, you can check with us and hopefully we’ll help give you some peace of mind! But, we digress from the topic at hand. 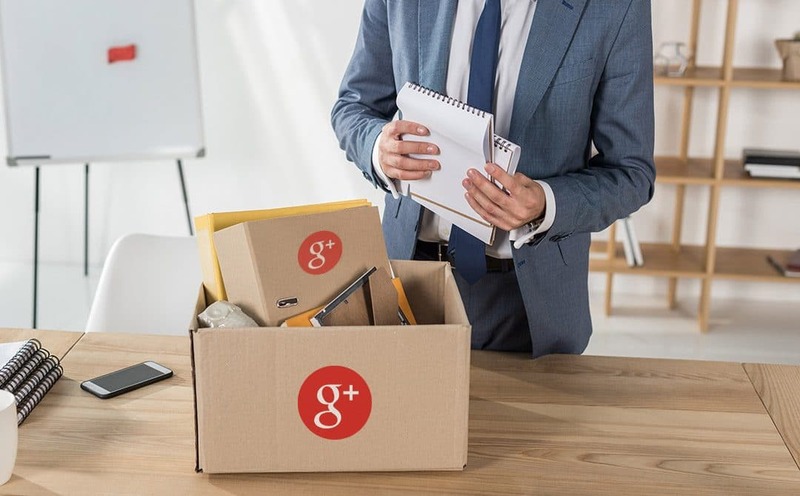 During the next few months Google will release instructions to its Google+ users on how you can best migrate your most important content from Google+ to your other social networks. You can also download what Google+ content you want to save, which you can learn about here. Other than that…there’s not too much else to do, really. If you’ve never used Google+ or set up an account, consider it to be a lesson in social media that not every network is as it’s cracked up to be. However, if you’re upset about losing your community on Google+, you should at least reach out to its members and inform them of where they ought to go next if you still want to stay in touch, and migrate your content to a more active network such as Facebook or LinkedIn. Do make the announcement, and do update the announcement to all of the social media networks you use, not just the one. That way everyone will be informed and can make adjustments where necessary. If you have Google+ linked to your website currently, and it’s maintained by V3 Media, get in touch with us after you’ve migrated your network and come April when the network is no longer there, we can remove it from your website for you. You can also check out our blog on other social media networks worth posting your content to if you’re truly stung about losing Google+ (or if you need social media in the first place and want to get started). You may also discover that by removing Google+, your website may need a revamp in the first place—or maybe you need a website and social media, period? If so in either case, let our professionals at V3 Media know and we can help get you a great website. For any questions you might have about the latest social media networks, we’re more than happy to discuss that in our one-on-one consultations—even if it’s rehashing what you already know in this post!